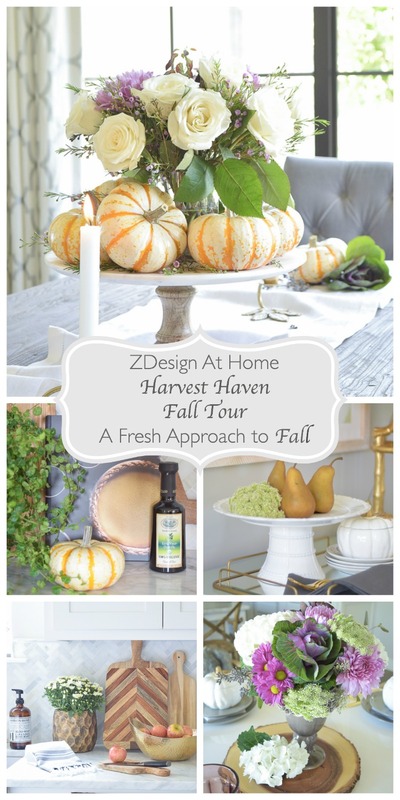 Welcome to the first ever fall tour of ZDesign At Home! 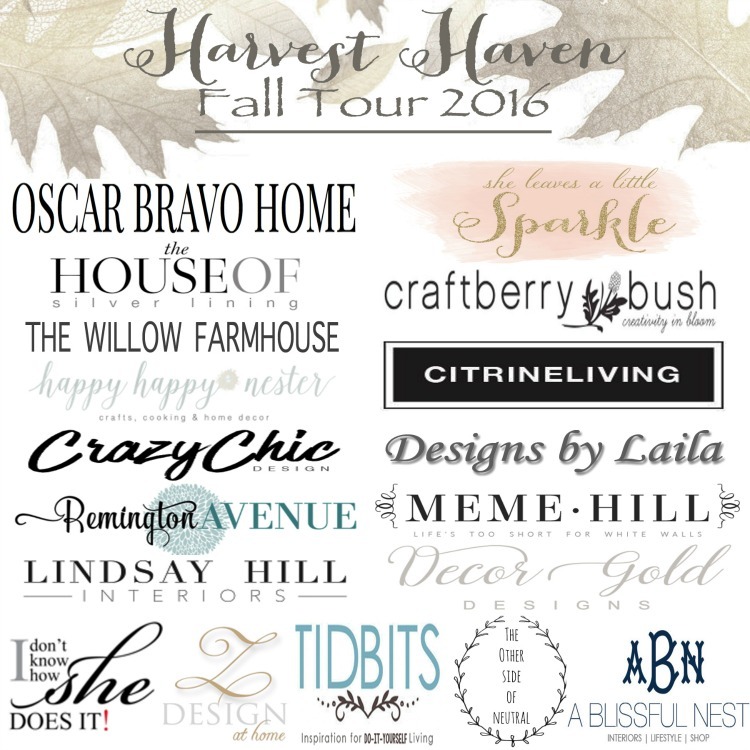 Thank you for joining me and all of us today for the Harvest Haven Fall Home Tour 2016, hosted by Summer from She Leaves A Little Sparkle. 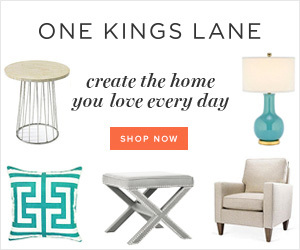 If you are new here, this blog is a home decor and lifestyle blog where I share decorating tips and stylish finds for your home and I’m super excited to have you here today whether this is your first time here, or if you are a regular with me!! And a big welcome if you are coming over from the inspiring blog of Lucy of Craftberry Bush (she’s so incredibly talented, isn’t she, friends!?)! I couldn’t be more excited to be participating in this tour with some of the most talented bloggers (and friends) I know and you will have an opportunity at the end of this post to link to any or all of the amazing participants in the tour so stay tuned! But first, a word about fall decorating from me…I absolutely love the change of the season, love what fall stands for with the gathering together of family and friends in thanksgiving of our many blessing, and I love seeing and experiencing the colors of fall outside but, sometimes the oranges, golds, and browns that come with the season don’t flow the best with my indoor color palette. So, I’ve come up with A Fresh Approach To Fall to share with you this year that I hope you will enjoy! 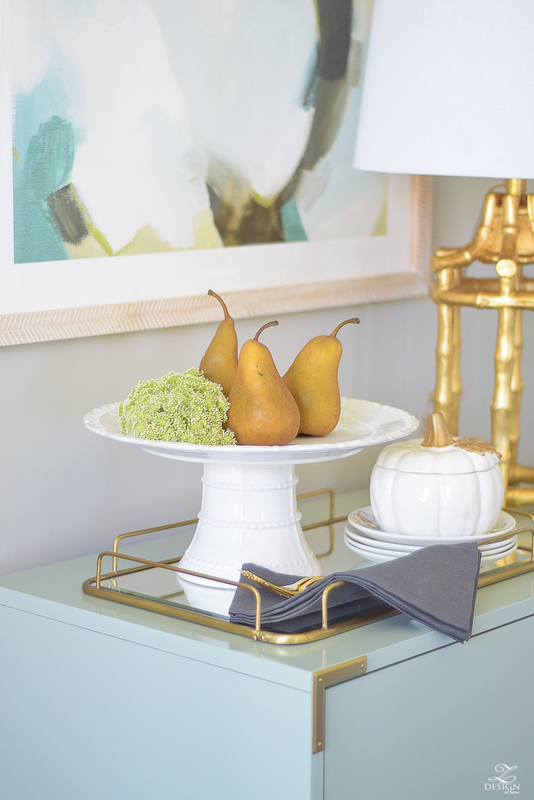 The goal of this blog is to inspire you within the four walls of your home and I hope my unconventional approach to fall will inspire you this season to do something a little different and to incorporate some of my ideas into your fall home! 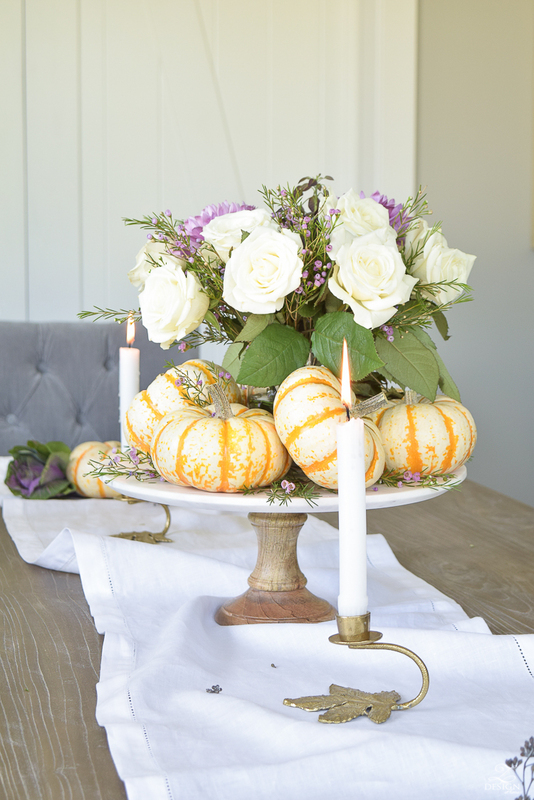 So without further ado…I first started with a casual fall table scape that included my fall color crush this year of plum! I also shopped my home and was inspired by my floral pillows that I’ve been using all year and have picked up on the plum color in the fabric and will be using this color througout my home this whole holiday season. 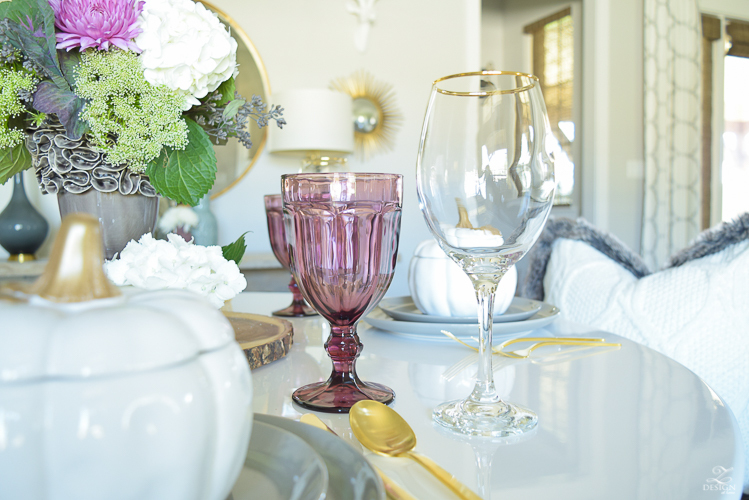 I started my table with these yummy plum goblets and then built upon that with a floral arrangement full of beautiful shades of plum and madeira. 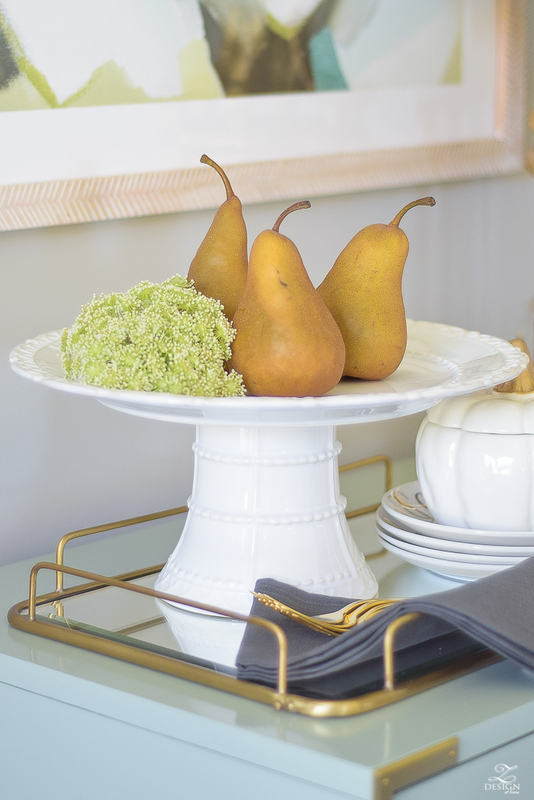 I also used my gold flatware, gold rimmed wine glasses, and my everyday gray dishes to create a casual setting for a fall brunch (we love a good Saturday brunch around here!). I recently found these lidded ceramic pumpkin bowls that will be on repeat until thanksgiving and until the fall season passes. They’re just darling and I can see us using them many times over the next few months. I pulled out my favorite faux fur throw and fur trimmed pillow so that we can begin to enjoy them for the next several months. I gave some tips and talked about my predictions for fur trends this year in a full blog post here. 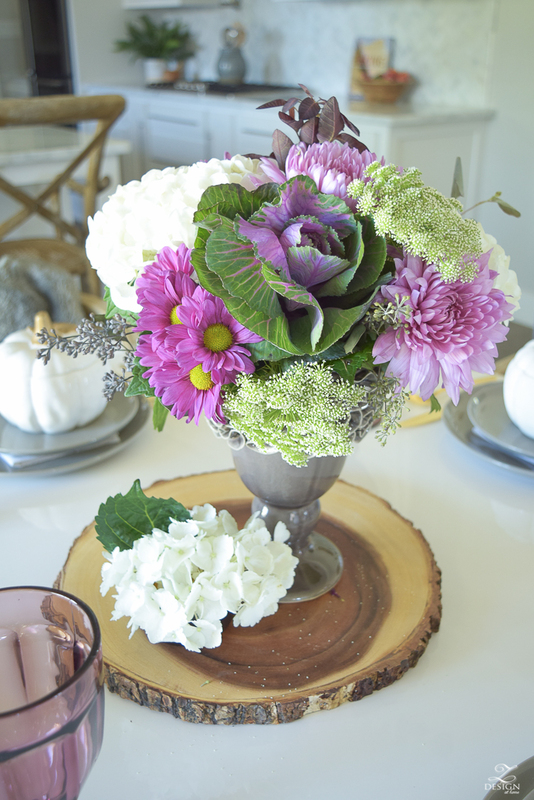 For my fall arrangement in this room I used an assortment of white hydrangeas, light and dark plum colored mums in two sizes, seeded eucalyptus, brassica, and some fancy greens in a rich reddish plum to set the mood for my table. 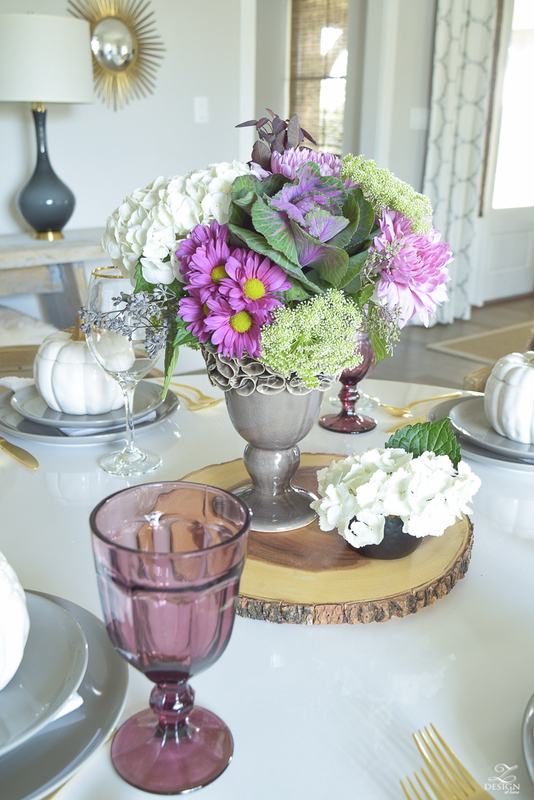 I then placed them atop a wood slice to give a nod to the fall season, plus it adds some texture to my table to make the perfect centerpiece for this setting! For the console table adjacent to the casual dining area where my table scape is, I added some simple seasonal flowers but still used some white hydrangeas as a transitional piece since it’s still super early in the fall season around here (the temps are still currently in the 90’s here). I also used golden rods and white mums along side the hydrangeas in a mirrored terrarium, and white mums in my favorite plum vase. 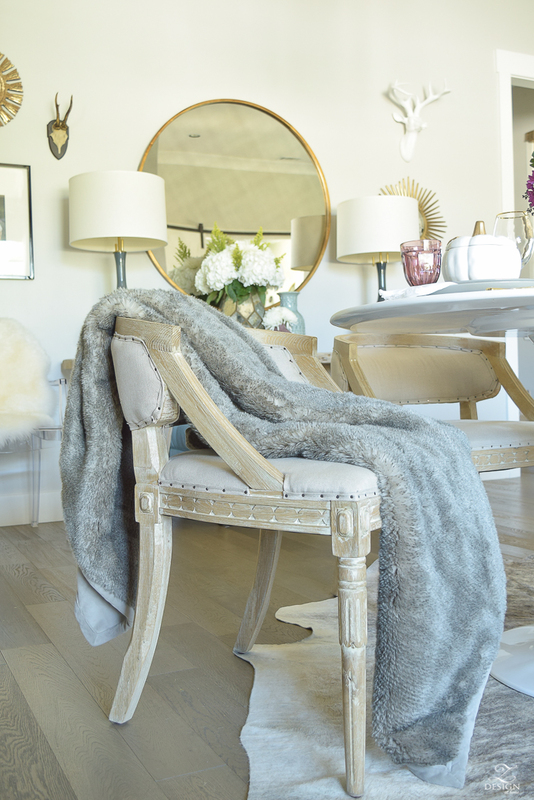 The antlers on the wall already lend this space to the fall season and then again I shopped my home and added sheep skins to complete this area for that modern fall look and feel I was going for in here! We also moved the mirror from the fireplace (it used to be in the living room seen here) to this area to enhance these seasonal updates. The changes are subtle and simple but still give this space that fallish feel. 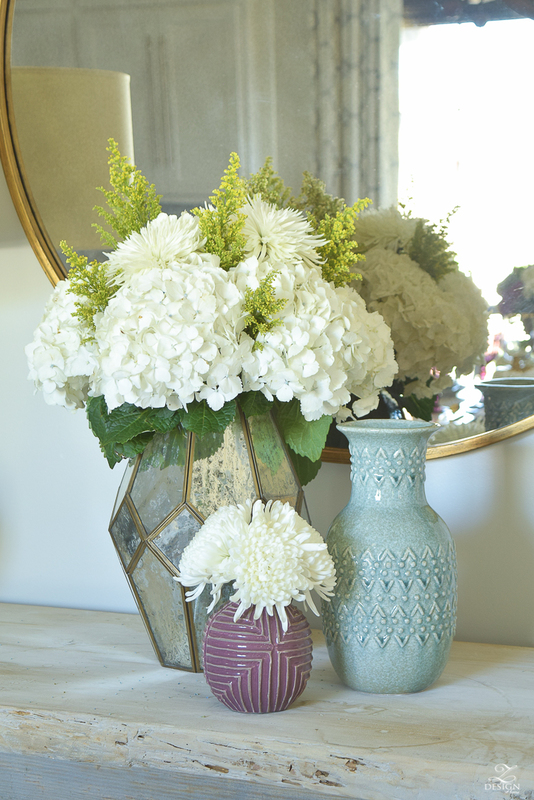 This little plum vase was my inspiration piece for my fall color palette in addition to my floral pillows that I pulled from. 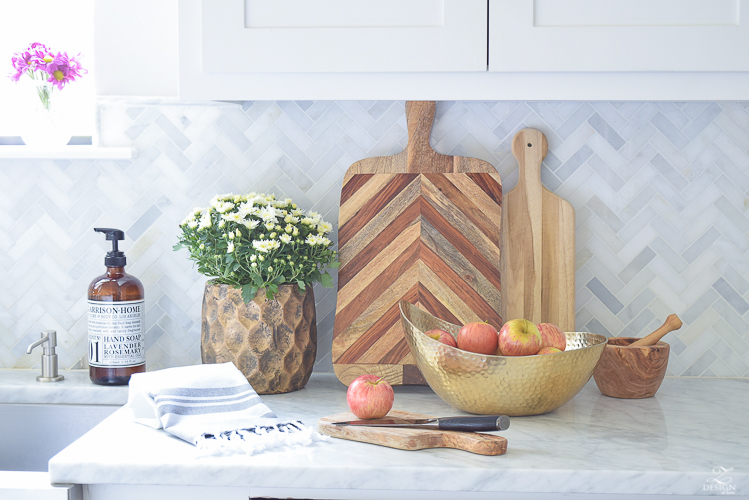 Next I turned my attention to the kitchen where some fall updates were definitely welcome to my all white palette in here. I added cook books, cutting boards, brass and coppery tones, and fresh plants and flowers in here as well, along with some seasonal fruit. I hope you enjoy this part of the tour because I am definitely enjoying the warmer changes in here! 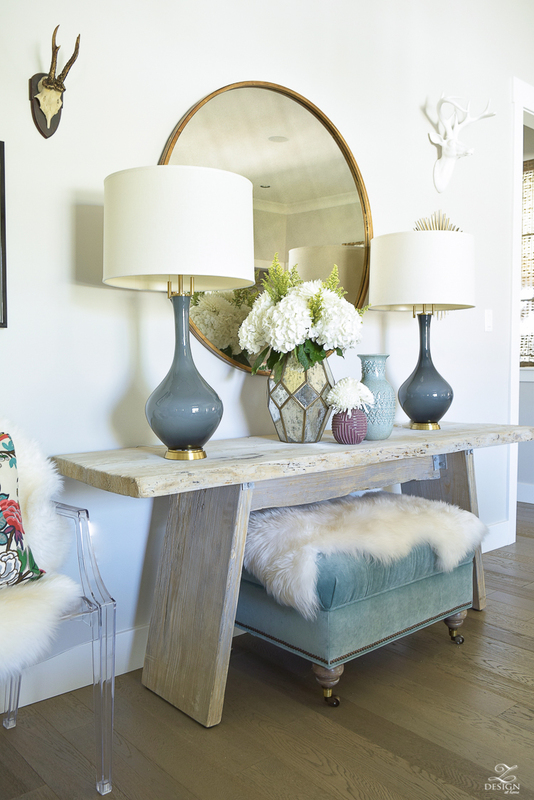 The warmer updates give this space a more welcoming feel as you enter and pass through the room. A small pumpkin made a 1st appearance in here too. 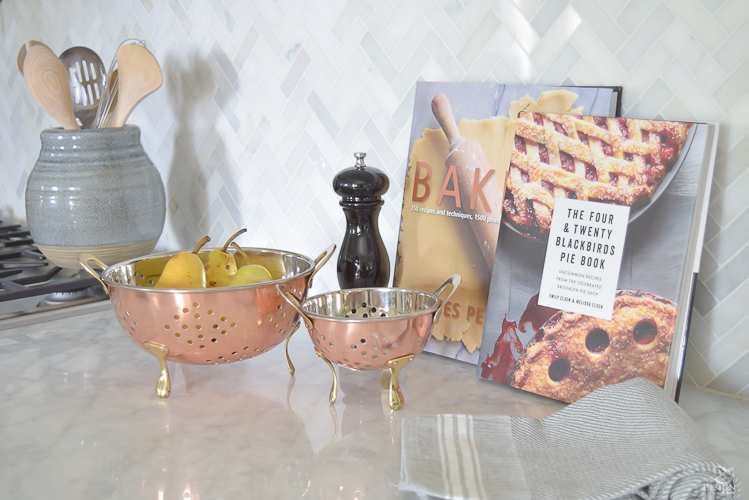 The brass and coppery tones in here really warmed things up and I found these copper and brass colanders at HomeGoods a while back but have sourced one similar here. 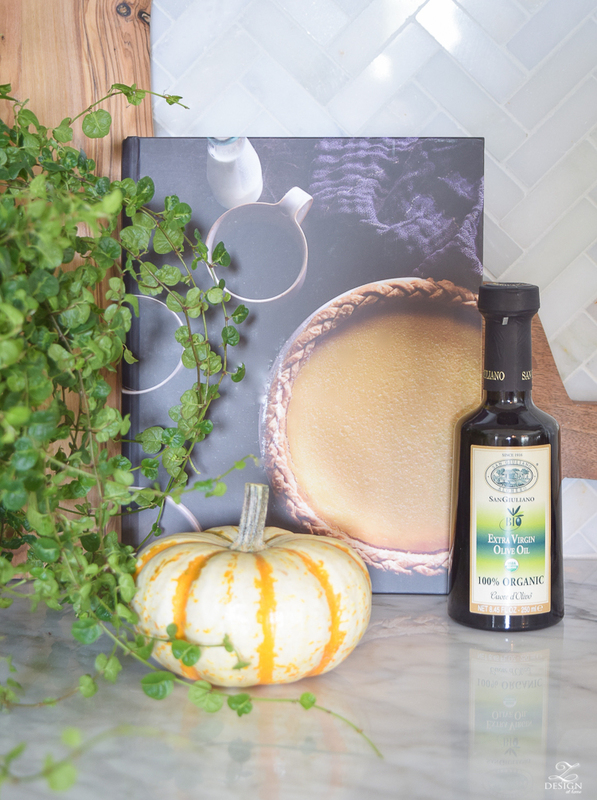 The cook books are not only functional but bring in the shades of plum I am using in my fall decor this year and, The Four &Twenty Blackbirds Pie Book is just perfect for holiday baking in case you haven’t seen it yet!! 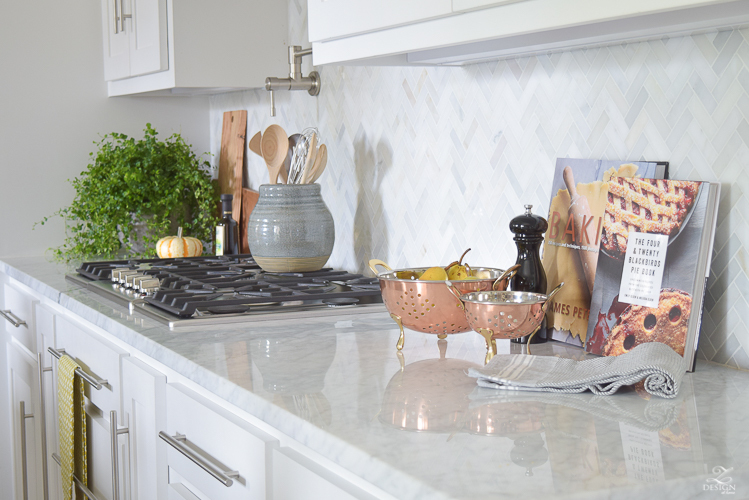 I love the touch of warmth the black pepper mill adds to the space and love how it pops against the colanders and the white backsplash. TIP: Adding black accents to a space or vignette can add a much needed touch of drama that can take any space to the next level, especially in seasonal decor where it might be unexpected! 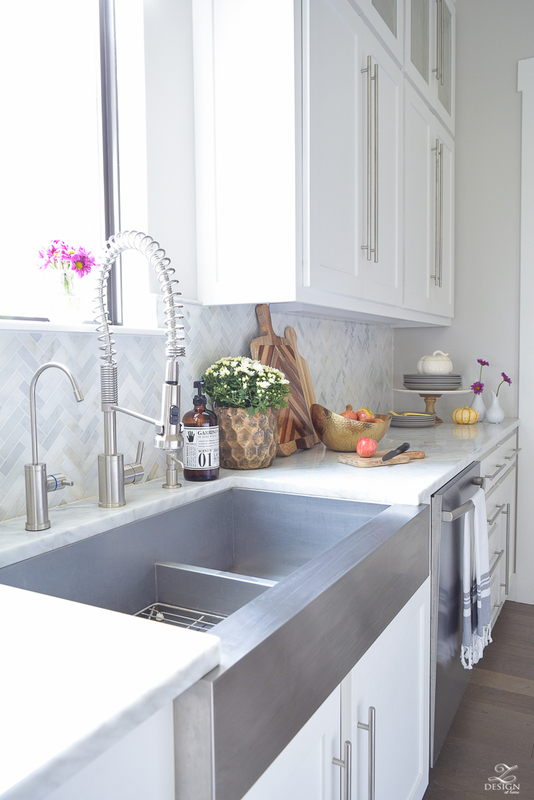 Next I turned my attention to the sink side of the kitchen where I added my favorite flower for this time of year…white mums with a yellow center. 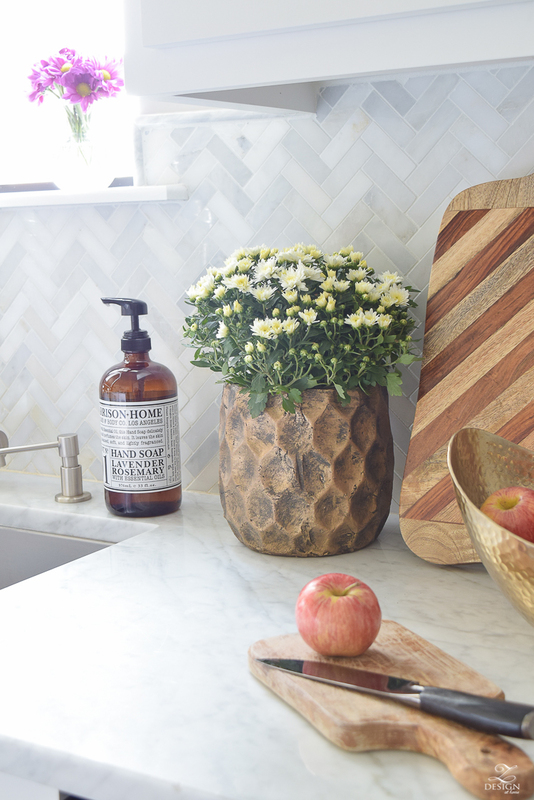 I pulled out my favorite cutting board to lean against the white backsplash to warm things up, along with adding a hammered brass bowl (similar here) for seasonal fruit, and a rustic, coppery colored honey comb pot to hold my mums. 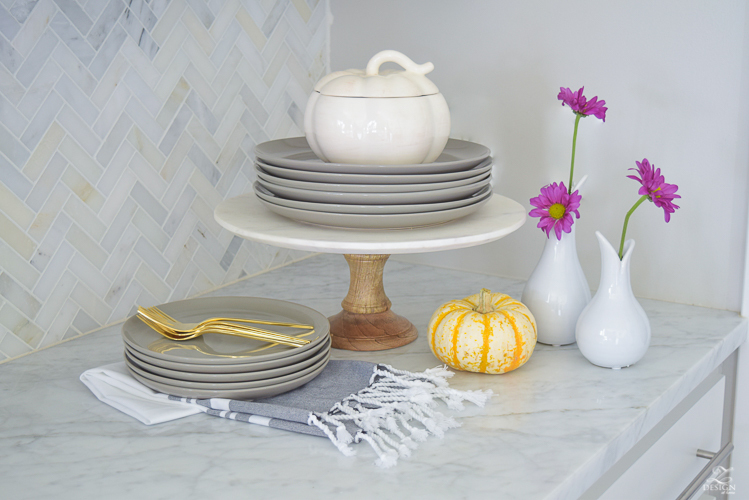 I created a little fallish serving area in this corner with white ceramic pumpkins, and again my gray dishes and gold flatware. Another real pumpkin made an appearance here too. I love these tiny pops of color through bringing nature in via the white/orange pumpkin and plum colored mums! 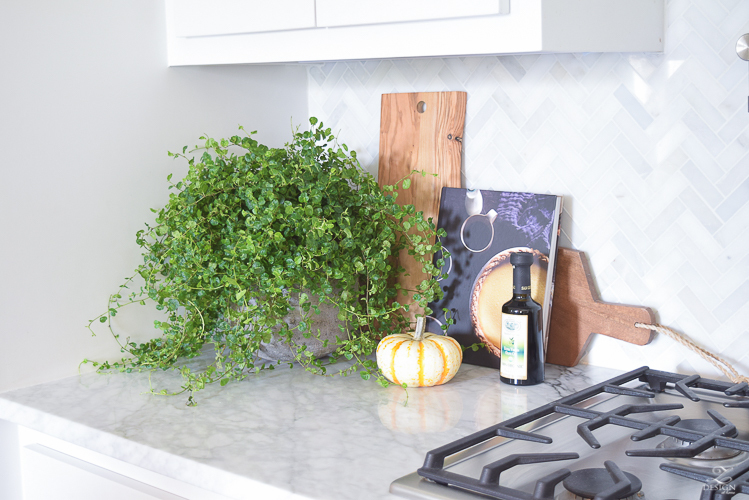 The mums were my opportunity to bring my featured color to this area of the kitchen to help continue my fall color palette over here. And last but not least I turned my attention to the dining room where we’ll be gathering together to give thanks this year. We recently updated our dining room and if you haven’t seen the reveal(s) yet you can catch that here & here. 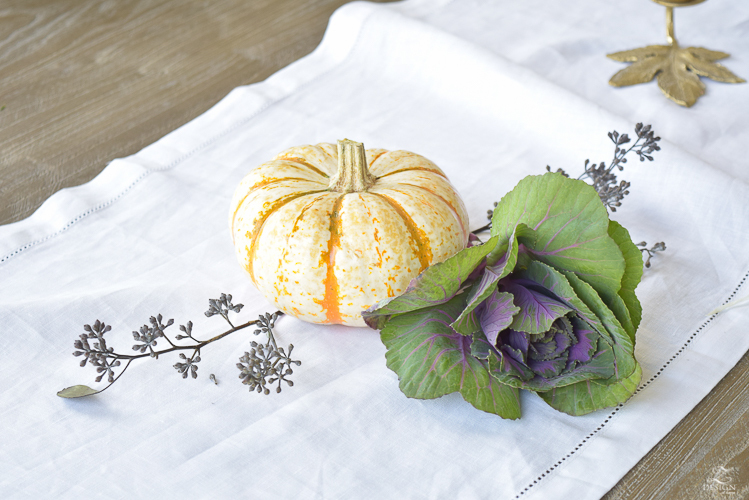 I wanted to create a simple centerpiece for my table so I started with this white hemstitch linen table runner to keep things light and fresh, and to add a contrast to my rustic gray table. 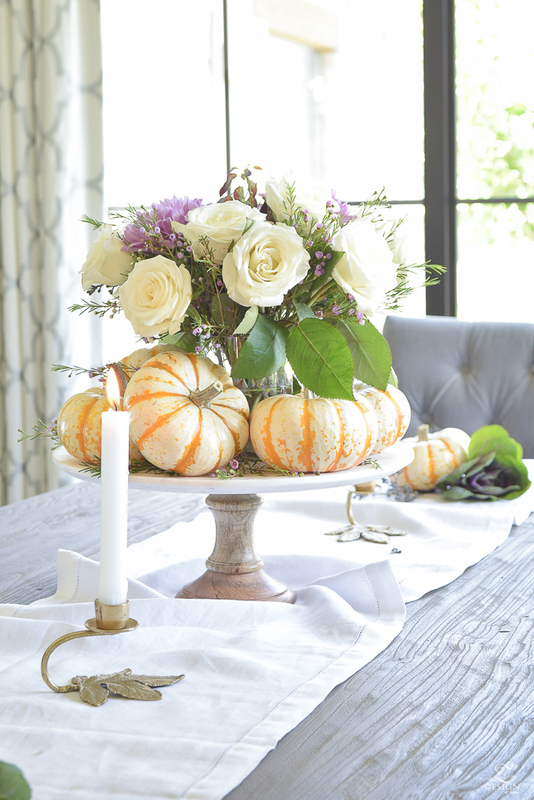 In keeping with my theme this year of all things simple, I only added some brass leaf candle holders (that I’ve had for more years that I can count), and I added some pumpkins, brassica, and seeded eucalyptus for garnishment, and then just a simple, organic centerpiece for the table. I used a marble and mango cake stand with small white & orange pumpkins centered around a clear vase full of simple white roses and light plum colored wax flower. The wax flower and brassica bring in that touch of plum to again keep things flowing with my color palette for the season. Next I dressed up the credenza/bar cabinet area where dishes and linens are stored and where I’m positive these accessories will remain for the entire holiday season. 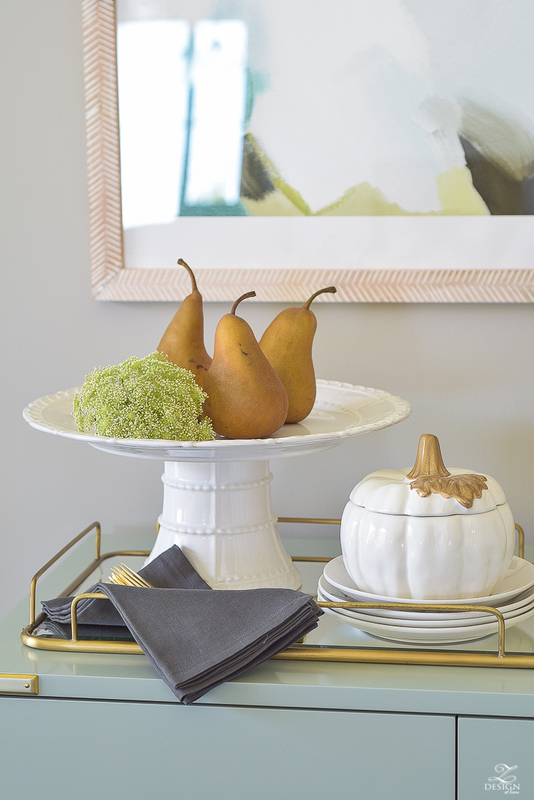 I brought in this elegant Skyros cake stand, one of my lidded pumpkins for decoration and set everything atop this beautiful brass and glass tray to create a dessert station in this area of the room. 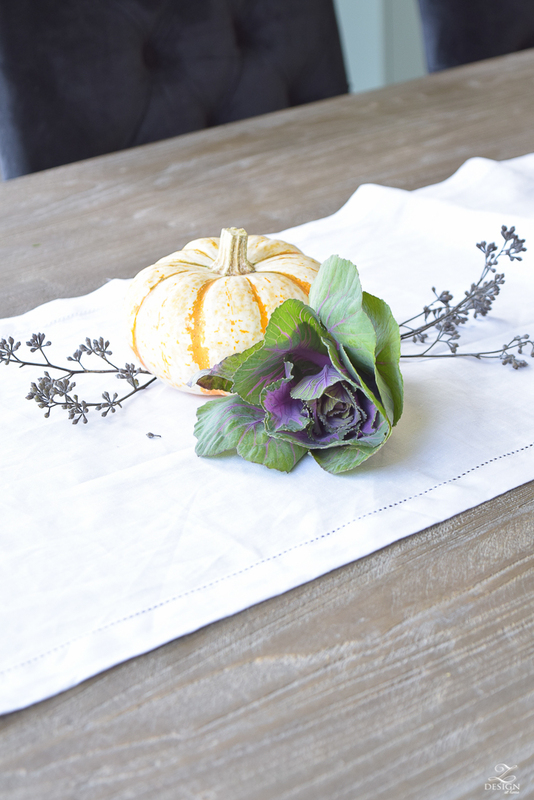 I’ve also included someBelgian flax linen napkins along with my gold flatware for the occasion. 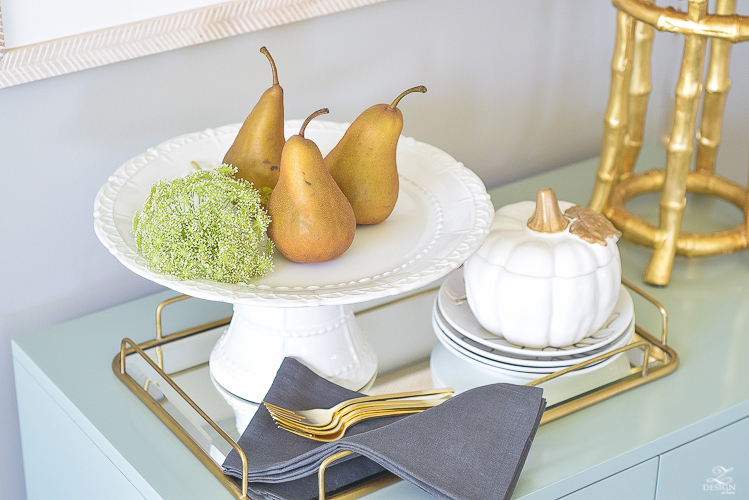 All of these functional items and accessories were chosen in keeping with my Fresh Approach To Fall theme. This brings us to the end of the tour. 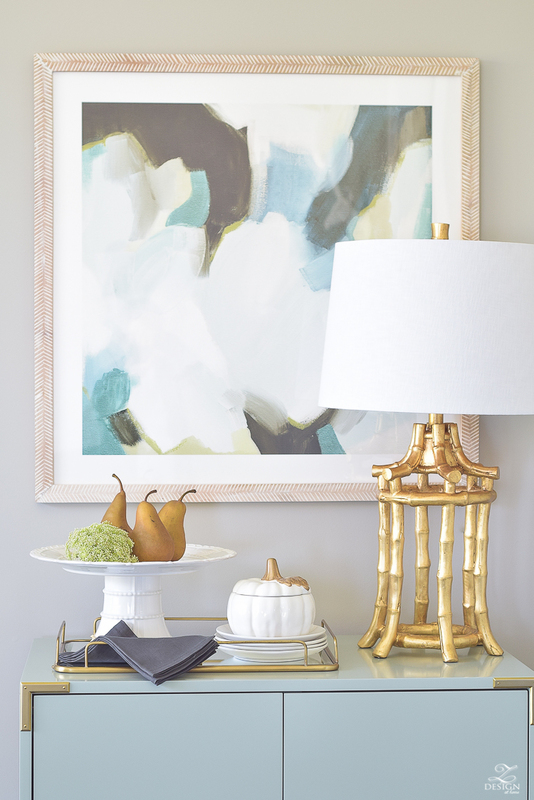 I hope I’ve inspired you to do something a little different this year with your fall decor by stepping out of the box and following your design loving heart. 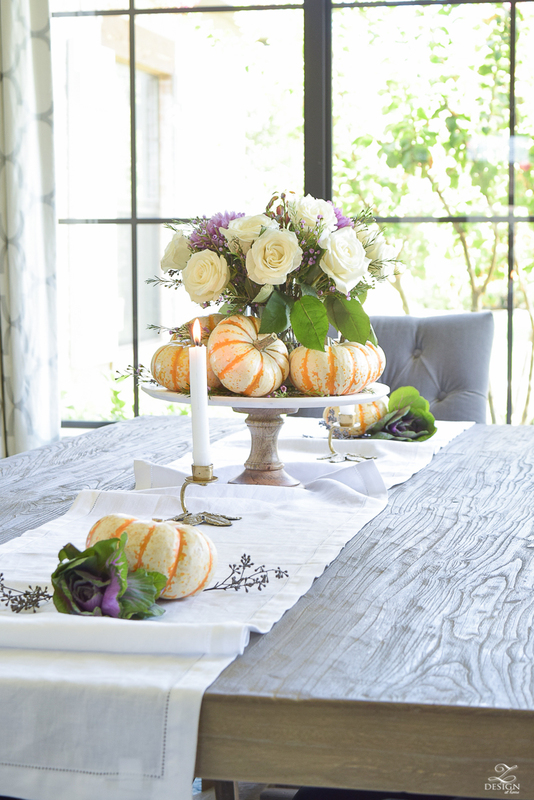 Just because fall decor typically calls for orange leaves and brown branches doesn’t necessarily mean you have to go that design route if you don’t want to. So this year, my advise is to step out of the box by adding some plum (or whatever color you want to use this fall) and just let your creativity flow to come up with fall decor that suits you and your home, even if it’s not the traditional way of doing things. But most of all, enjoy it with the ones you love!! Happy fall, y’all!! 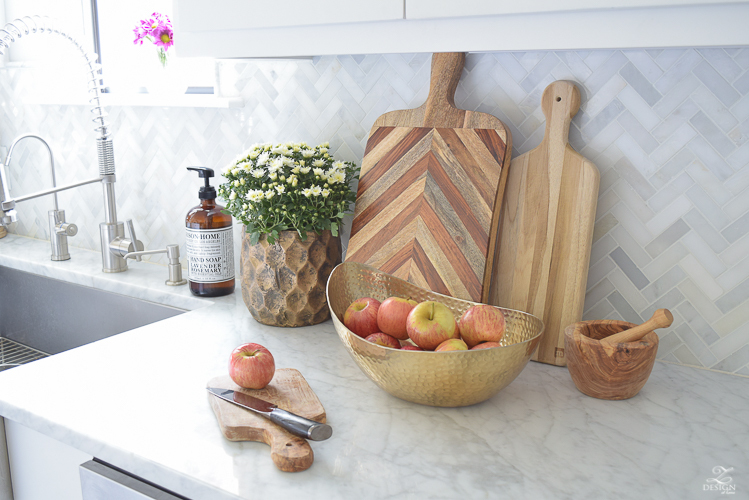 Thank you so much for stopping by to see my fresh fall home and I hope you will come back later this month for another fall tour where I’ll be sharing some fun, easy tips to get your home ready for fall AND winter. I would now like to invite you to head over to the beautiful blog of my friend Gloribell of I Don’t Know How She Does It . Gloribell is super talented and takes the most beautiful, artistic photographs. 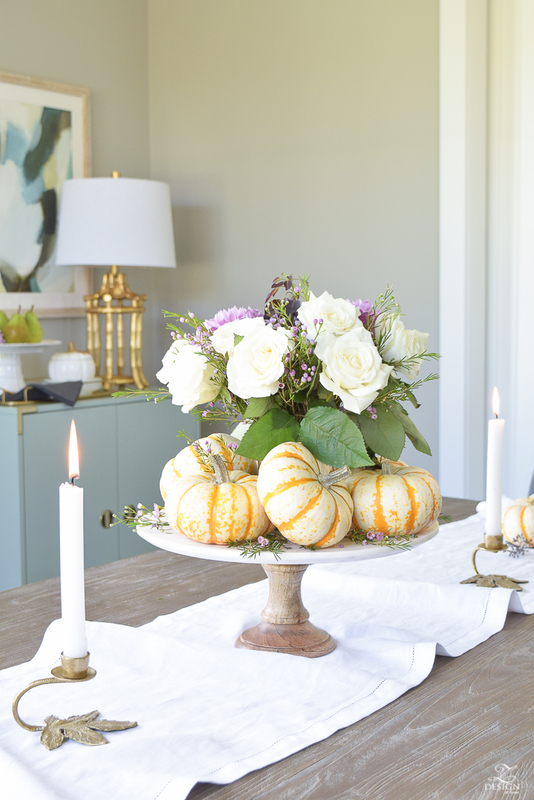 I know you will enjoy and be inspired by her fall home just as much as I have been! *This post contains affiliate links for your convenience and where an item is no longer available a similar item has been linked. Thank you for supporting the brands that make this blog possible! Bree, I LOVE this! 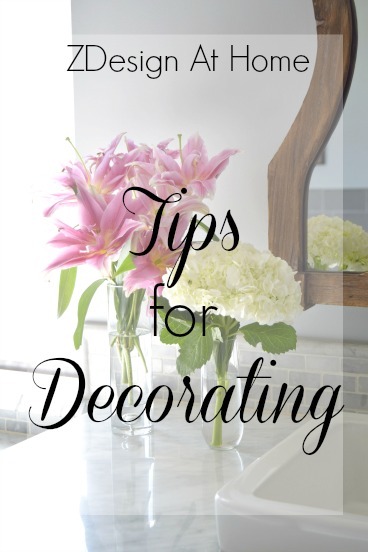 Especially your centerpiece in your dining room! Love the shades of pumpkins you found too. 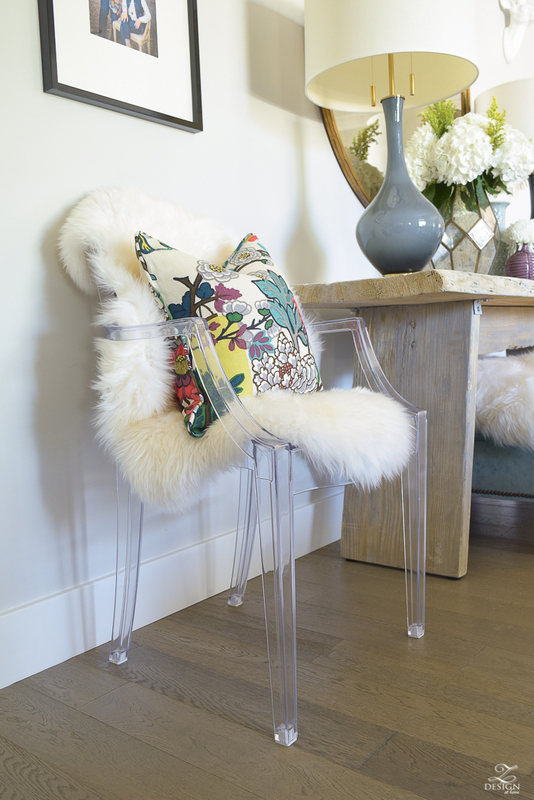 Not overdone, just fall-perfect in your gorgeous modern home. Beautiful tour! All your floral arrangements had my heart! So beautiful Bree! 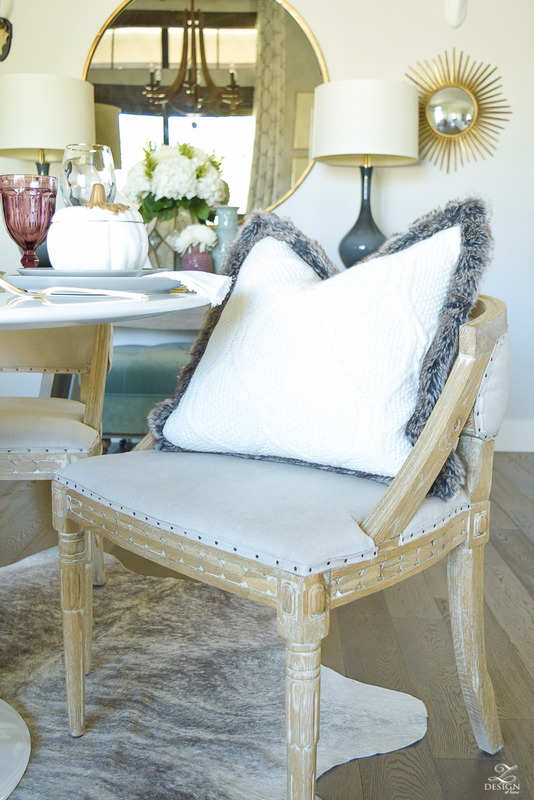 I love that we chose the same accent color this season! You used your plums an purple in such a lovely way and I especially love your touches of copper! So beautiful, Bree! I think we were on the same page with the subtle touches. 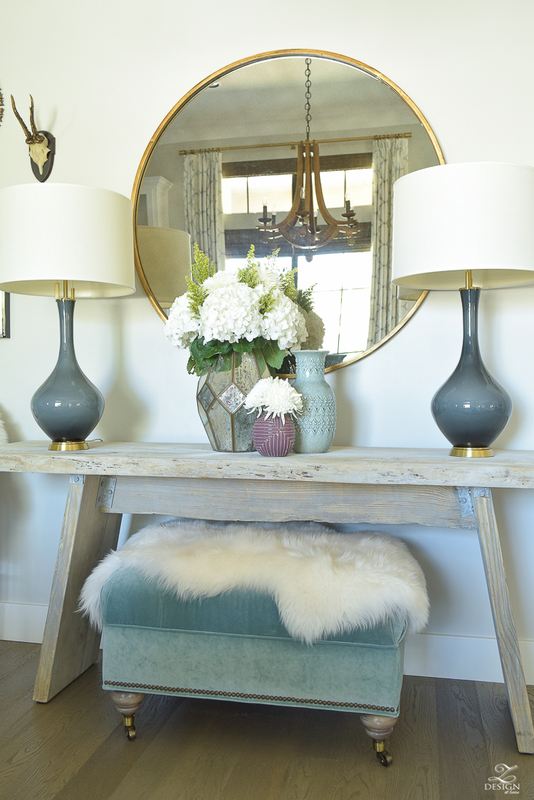 Love your soft and pretty color palette. Gorgeous, my friend! 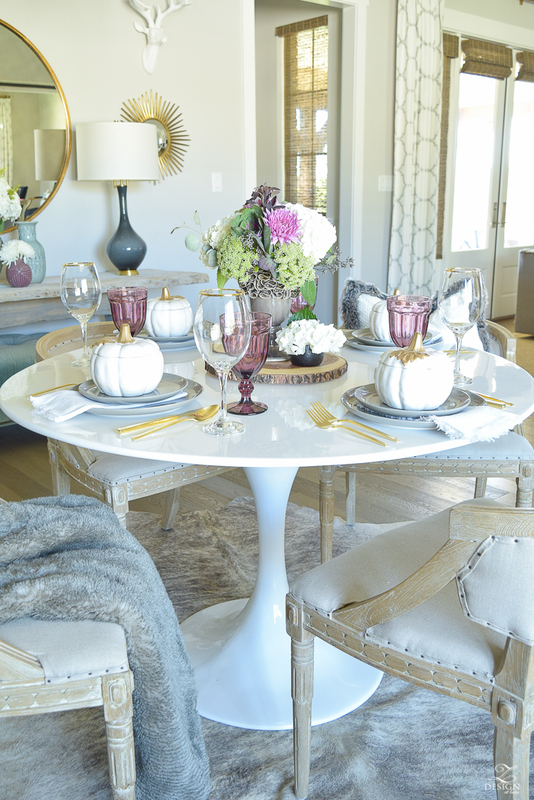 It’s all so gorgeous and I LOVE the way you bunched the runner on the dining table to add texture. Really beautiful, thank you for sharing! Hi Katie!! Thank you for stopping by and for the sweet comment. Happy fall!!! Bree!!! Oh my goodness this is fall perfection!! Your entry is stunning, I love the hints of purple you used, and all of the fur is just cozy and gorgeous! 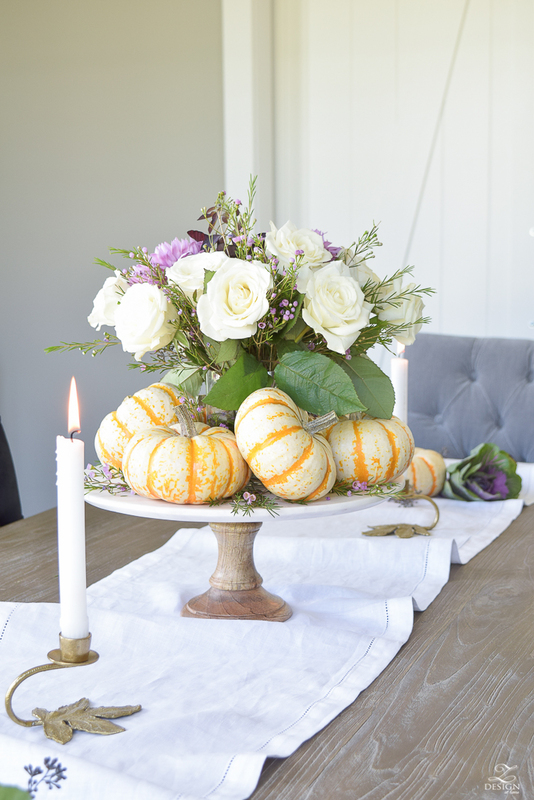 I loved your fall decor tip too! Ok, I have had brassica sitting in a pitcher in my sink for three days and I haven’t had time to get an arrangement together but you have inspired me! It was so pretty at my Kroger that I had to grab it. I’m so thrilled that you could be a part of this tour, thank you so much for sharing your home and your creative talents with us! Sending you love and hugs!??? Hi! Awesome “Fall Home!” Question: I have hesitated to purchase the gold flatware, worried that I would have to hand-wsh everything. 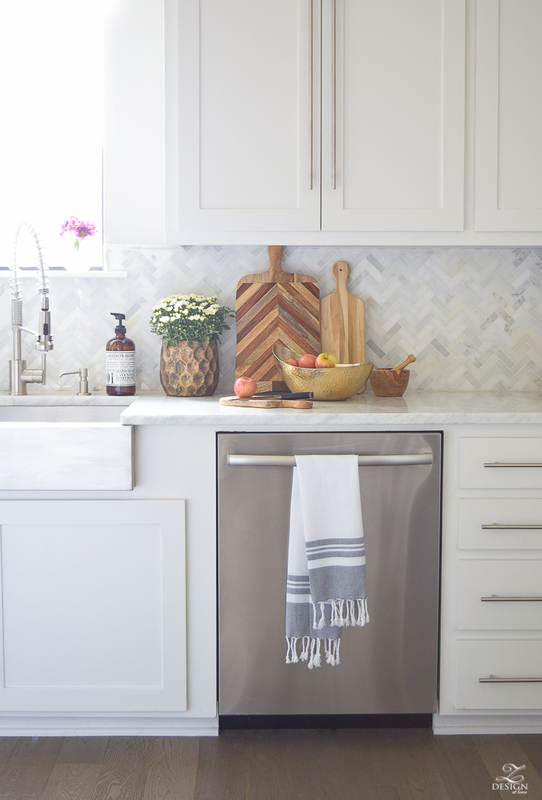 Do you hand wash, or use the dishwasher? Have they tarnished at all so far? Hi Kristy! I don’t use these every day and when I do use them I do hand washed them but mostly because the water where I live is horrible (it’s so bad where I live that we have to have an RO faucet for drinking and cooking). They are stainless steel (18/0) so they should be fine, especially if you have decent water. I hope that was at least of some help but let me know if you have any other questions, and thank you for the sweet compliment on my tour!! Happy fall! Simply gorgeous Bree!! 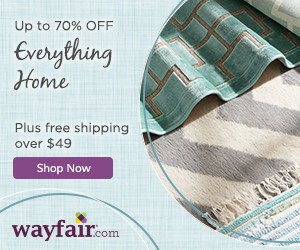 I love the new accent color, and all of your organic elements. Beautiful, my friend! 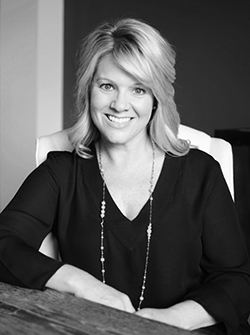 HI Bree, I have so enjoyed your post and fresh take on fall decor! Love the plum and fur touches! Oh Bree! Everything is just SO beautiful!! Thank you so much Laila!! Thanks for stopping by and for commenting. As always it’s a joy being on these tours with you. Happy fall my friend!! Wow, so much inspiration here! 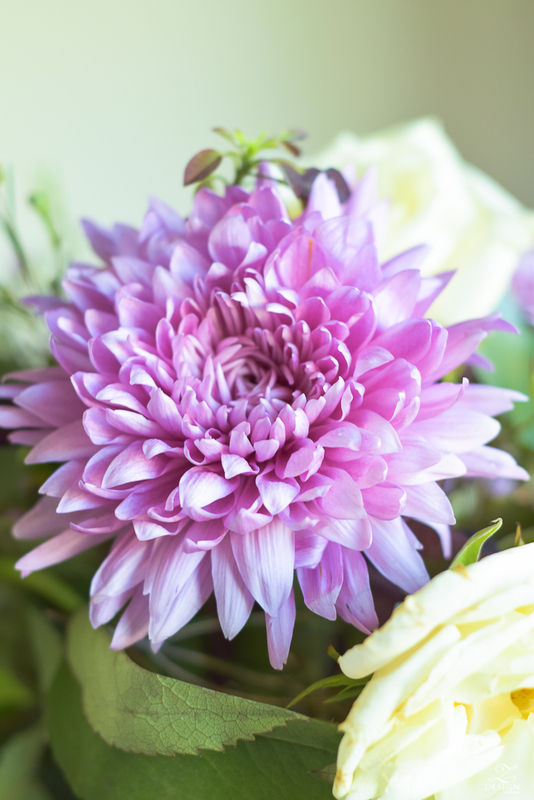 I love your gorgeous home and your flowers are stunning. You got me to rethink my flower bouquets! Such a great tour! Thank you so much Janine!! Thanks for stopping by and it has been so much fun doing this tour with you! Happy fall!! Love seeing purple as a fall accent color! Not done nearly often enough! Beautifully done! Oh Bree, you are so good at this! 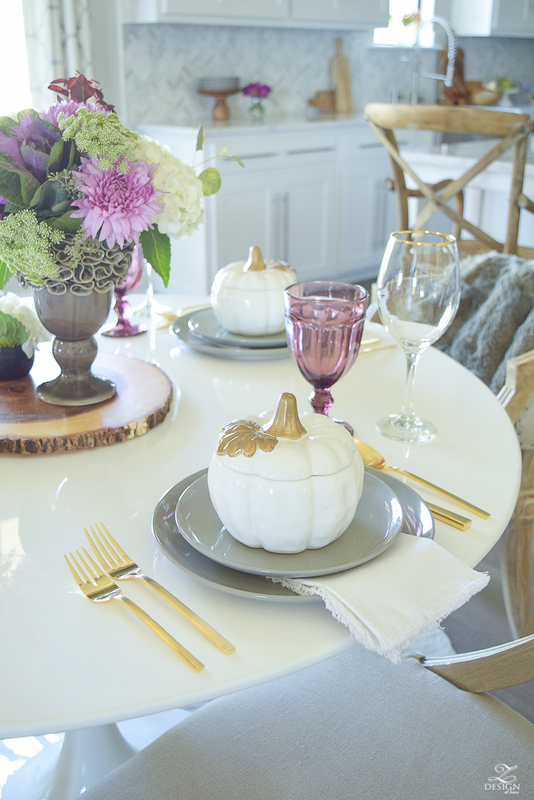 Love how you thought outside the box and incorporated the plum color to your fall decor. Also, that moment with the pears… WOW… stunning! Thank you so much Rebekah and thanks for stopping by!!! Your tour was absolutely amazing and I couldn’t be more excited to have been on this fun tour with you. Happy fall my friend!! 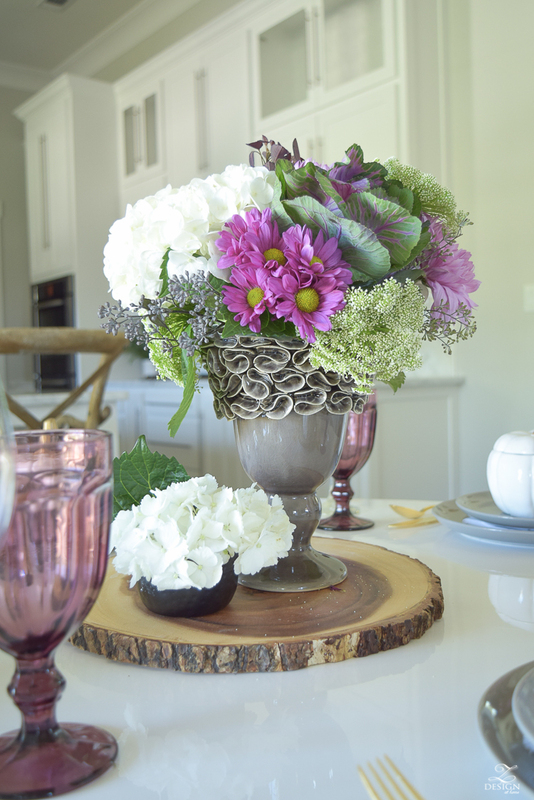 Where did you get the grey vase w/ the ruffled top that is sitting on top of the slice of wood? Where did you get your kitchen drawer handles? Love them! Hi Bree! You’ve done beautiful work here. Looks amazing. Can you tell me where you got those beautiful lamps on your dining console table. The bluish/gray ones. They are incredible.